ControlTrends is on a mission to document the Assets of our industry, our people, in short videos, injecting fun, an ingredient not ever used before in our industry. Great job, well done on the CTA awards Eric and Ken. A fun event extremely well attended even with strong competition from a myriad of simultanous company events. 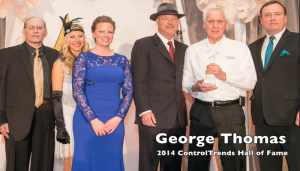 The pinnacle event of the evening was — Michael Newman, the Godfather of BACnet and George Thomas, master of all networks were inducted into the ControlTrends Awards Hall of Fame. I first met Mike at the University of Alberta mid-1980s, early days for DDC. I had been working with the project since 1975, an industrial DDC system custom crafted for U of A. Our frustration with the first DDC system were similar to Mike's at Cornell. He was struggling with similar concerns, trying to move the major control companies from pneumatics to true DDC while creating interoperable standards. Mike came to meet with the team and share his thoughts. This was before BACnet but Mike had a dream and as we all know his dream is now our reality. Mike is still presently Manager of the Building Automation and Control Systems Integration group within Facilities Services at Cornell University. The system now serves over 225 buildings with nearly 980,000 sensor and control points, features extensive graphic displays and plotting capabilities, and was one of the first such systems to make use of multiuser, multiprotocol computers in an integrated, multivendor field panel environment. Mike never quits and is still working with BACnet on many levels to finish his dream but the global standard BACnet will go on forever and is documented well in his book. "BACnet - The Global Standard for Building Automation and Control Networks"
The book is not only a must have resource but contains much insight to his journey. This is a fun bit of history involving both of these two hall of fame inductees from the AutomatedBuildings.com archives. 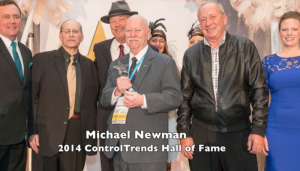 In an interview with Contemporary Controls, H. Michael Newman tells his story of leading the charge for adopting the BACnet® protocol, and the battles and victories that ensued by George Thomas. Also very pleased that George Thomas, another long time industry friend, was also inducted into the hall of fame by Eric and Kenneth. I was very pleased to be part of the changing of the guard and to help usher in the latest crop of Young Guns. Knowledge Sharing to Drive Learning Only if you can hire good people, train them well, and ensure they continue to learn throughout their career will we see industry, from the operators to the engineers, achieve the potential we all know is there. - Brad White, P.Eng, MASc, Principal, SES Consulting, Inc.
KMC Controls, a leader in building automation systems, announced today that Erich Kreuter, technology manager for KMC Controls, was honored at a ceremony in the Prairie Ballroom of the McCormick Hyatt Hotel this week during the annual AHR trade show. 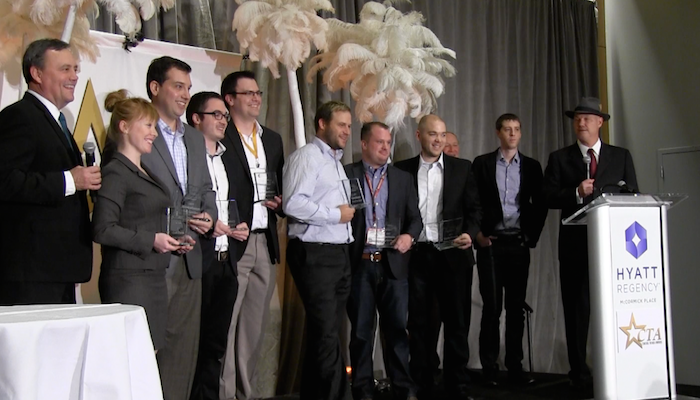 Kreuter received the 2014 ControlTrends Top Gun Award for being a young industry professional making an impact in the areas of product development, technological advancement, industry involvement, and promoting building automation. A third-generation family employee, Erich received his BSEE from Purdue University. He is a LEED Green Associate as well. Erich began work with KMC as a design engineer in 1998, working with analog and embedded hardware for KMC's control products. Today, Erich serves as Product/Technology Manager for hardware solutions, specifying products and manages projects through development and initial sales. Many of KMC's new and cutting-edge products are the results of Erich's efforts and influence. Examples include the KMC's Conquest Controllers, AppStat, and SimplyVAV. Erich's Grandfather, Ken Kreuter, founded KMC in 1969. Eric and Kenneth are to be commended on bringing this event to the industry, we thank them and of course all the sponsors who made it happen. ControlTrends is on a mission to document the Assets of our industry, our people, in short videos, injecting fun, an ingredient not ever used before in our industry. Thanks again guys for videoing the 3rd annual Connected Community Collaborartory meeting. I was a bit disappointed there were so few there for the amazing presentations but very pleased that we will be able to collectively share this with many because you made the effort to make it into a great video. It will be a very long video but contains many little videos with words and pictures of great wisdom by our thought leaders. Next year I think we will drop the word meeting, as I believe it prevents folks coming to the collaboratory to learn and share. I watched a movie called Words and Pictures (2013) An art instructor and an English teacher form a rivalry that ends up with a competition at their school in which students decide whether words or pictures are more important. Like the movie I think our industry is finding that both words and pictures are necessary and when we share them using the internet of everything we increase everyone’s internet of Me and help Grow our only Asset our People.